Losing a pet is an emotionally challenging event for many families. Home burial is often the best choice to give beloved pets their final resting place near the family they loved. Before burying your pet at home, however, it's important to know the rules and procedures for pet burial. Find out what restrictions your local area has on pet burial. Ask your veterinarian or call city hall about these restrictions. In many places, as long as you own the land you can bury your pet there. However, some areas have regulations on the depth of burial, the material the pet is buried in and how the site of burial is marked. Pick out a plot. Look for a place on your property that has special significance. Choose a tree or shrub the animal used to nap by or another area associated with a fond memory for the burial site. Dig a hole 2 to 3 feet deep that is slightly wider and slightly longer than your pet. Take care to avoid digging in an area where there might be waterlines or underground wires. Place your pet inside an environmentally safe pet casket, box or blanket. 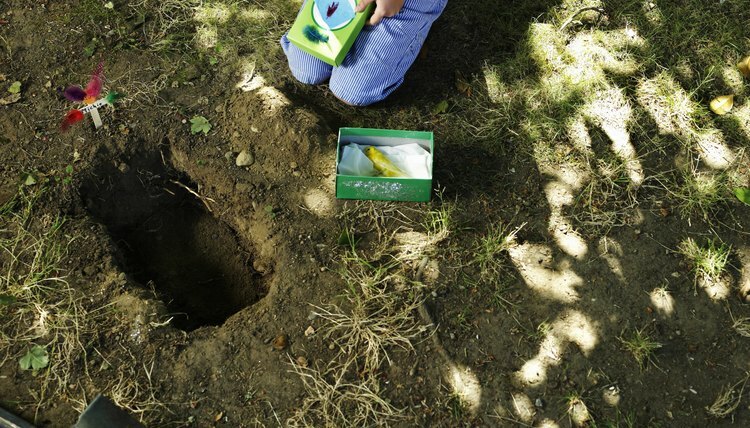 What you bury your pet in will depend on your budget and local rules regarding pet burial. Some areas may require that your pet be buried in an approved pet casket. Bury any special toys or other memorabilia with your pet to add a special touch. Fill in the hole with the dirt you shoveled out before and use the flat part of the shovel to pack the dirt down. Place a grave marker, such as a headstone or other decorative piece, over the top of the grave to discourage future digging in that area and pay tribute to your pet.